Catalyst can offer Selective Invoice Finance (sometimes also known as Single or Spot Invoice Finance) and Commercial Loans that are fast to access, simple to navigate and contract free. Our team background is in business, not banking, so we understand the challenges and pressures surrounding cash flow. We've done away with all the unnecessary stuff - contracts, set up fees, maintenance costs - and focused on the best of alternative finance. Clients like Catalyst because we understand what they need, and they can use us like an overdraft, dipping in and out of our services at any time. We know how complicated it is to manage the flow of cash in and out of your business. Especially when you have large orders to deliver, a big bill to pay or seasonal cash requirements. So we've developed funding options that boost your resources and help you move forward. We offer straightforward and fast alternative funding to UK businesses, whether that’s Selective Invoice Finance or a Commercial Loan. Hundreds of ambitious UK businesses have chosen us as the smart alternative to the big banks for their cash flow solutions. Above all, we’re totally transparent – no set-up, transaction, exit, non-utilisation or hidden fees. We’ve always seen customer service as one of our most important assets and have strived to offer excellence within our industry. We recognise our customers’ requirements and make the process easy in order to help the businesses move forward. We are thrilled to have received a ‘Commendation’ in the category for the ‘Best Alternative Business Funding Provider’ at the Business Moneyfacts 2016 Awards. The award celebrates companies who have consistently offered competitive products, the best levels of service and shown the greatest innovation in the business and commercial finance world over the last 12 months. The winners are chosen based on a combination of in-depth technical analysis and industry feedback. “Catalyst enabled us to borrow funds for a short period of time. The alternative would have been a long term loan which did not suit our requirements’’. “The Process was so easy, everything was fully explained every step of the way. Anyone who is not sure on Invoice Financing should try Catalyst Finance’’. “Without any doubt the business would have been in serious trouble if it were not for the support and entrepreneurial spirit of the Catalyst Business Finance team’’. 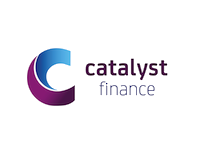 Catalyst Business Finance are well positioned to react positively and quickly to ensure that you receive the right product at the right price.